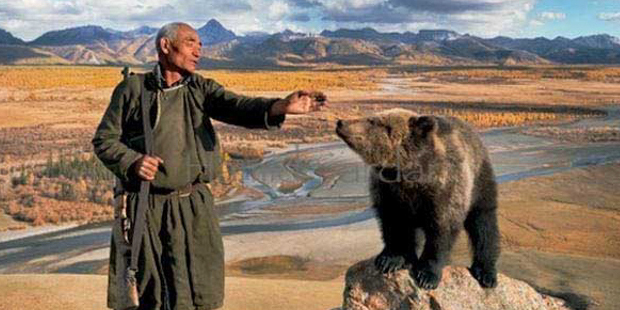 Dukha elder man reaching out to touch a wild bear, (http://hamidsardarphoto.com/). Like stepping into a time machine to a simpler place where beasts fight alongside man, the nomadic Mongolians known as the Dukha, now made up of roughly 40 families, are famed reindeer herders who live and travel throughout the northern Khövsgöl Aimag region of Mongolia. Originally from across the border in what is now the Tuva Republic of Russia, the Dukha reindeer riders migrated to Northern Mongolia in 1944 after the onset of WWII and Tuva’s annexation to the Soviet Union. The Dukha people fled into Mongolia, facing almost immediate deportation and hostility, because of several factors: their relationships with Mongolian traders that had formed over several decades, food shortages, disease that was killing off schoolchildren, and a little thing called collectivization (or the requisition of domestic animals by the Soviet government during the war). Domestic animals, as evidenced by tamed wolves, have been an integral part of the Dukha culture and tradition. Taking their pets was like taking a piece of their heritage. 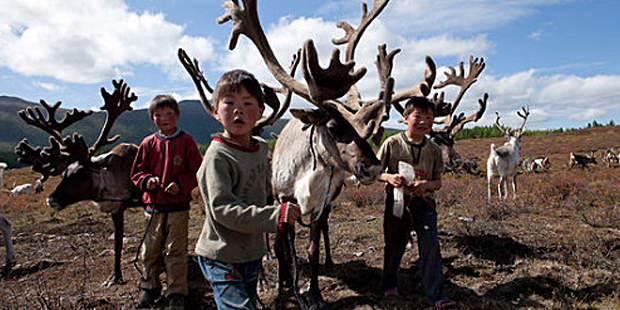 Dukha children playing with their reindeer, (http://hamidsardarphoto.com/). They persevered, however, and today they live a lifestyle very different than most other people. Their community is an amalgamation of daily sacrifice and the dependence that both the Dukha and their reindeer have with one another. They travel with the seasons, in constant movement and constructing temporary settlements along the way, searching for the next fertile piece of land that their reindeer may graze upon. They live in yurts made primarily of birch bark that resemble Native-American tepees with a 2-3 meter opening as an entrance. A large yurt may take the bark of up to 32 trees to make. Inside, a bag that houses the guardian spirits of a shaman rests in the rear of the yurt and animal skins cover the ground, upon which the family sleeps. Finally, a stove sits in the middle of the yurt. 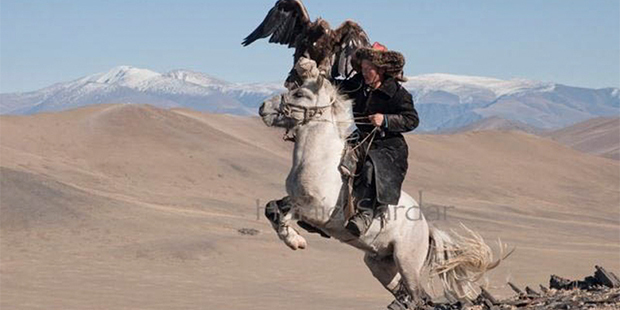 Mongolian hunter and his Golden Eagle, (http://hamidsardarphoto.com/). The Dukha use their reindeer for several daily tasks, including: hunting steeds, yielding their milk to make cheese, and collecting extra money through tourism by offering reindeer rides, crafts, and performances. But those aren’t the only animals the Dukha work with as they use domesticated wolves and golden eagles to hunt rabbits, elk, and wild boar. 13-year old hunter and his golden eagle (www.bbc.com). Their ancient way of life was captured in a series of stunning photos by photographer and researcher Hamid Sardar-Afkhami, which you can find on his website. What are your thoughts? Is it fascinating to know that cultures like this persist in our modern world, or is it concerning to learn that so few are left? Join in the conversation: comment below and share on Facebook!